These relay switches are great for standalone applications, or for three- or four-way circuits that can be controlled from more than one switch location. A three-way circuit requires one relay switch and one multi-way companion switch. A four-way circuit requires one relay switch and two multi-way companion switches. For single-pole applications, leave the "control" terminal unconnected. 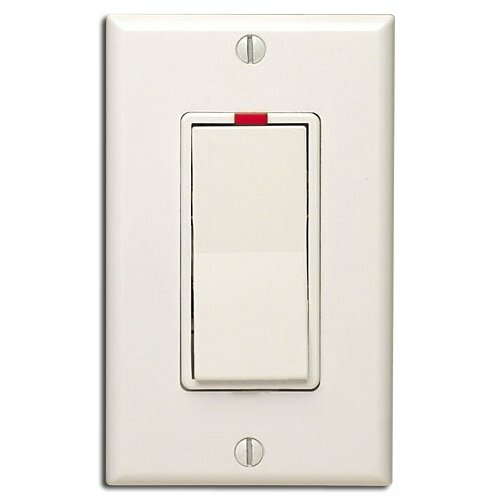 The switches respond to ALL LIGHTS ON and ALL LIGHTS OFF, and feature an LED that indicates the switch is on. They come with interchangeable white/ivory paddle switch covers. Trim plates are not included. Requires a neutral wire connection. Enjoy complete local and remote X10 control of high-power devices with this switch, designed specifically for high-wattage, higher amp loads. Capable of handling 20-Amp devices at 120V, this switch provides up to 2,400 Watts of control. This relay switch is great for standalone applications, or for three- or four-way circuits that can be controlled from more than one switch location. A three-way circuit requires one relay switch and one multi-way companion switch. A four-way circuit requires one relay switch and two multi-way companion switches. For single-pole applications, leave the "control" terminal unconnected. The switch responds to ALL LIGHTS ON and ALL LIGHTS OFF, and features an LED that indicates the switch is on. Requires a neutral wire connection. Note: Because this switch responds to ALL LIGHTS ON, use care when controlling non-lamp loads. Use an X10 appliance module or wall receptacle if you don't want your device to respond to that command. Defective exchanges for identical item within 30 days of purchase. After 30 days, please contact the manufacturer.